It's the time of year when nothing much happens. Everyone is either physically or metaphysically sick of winter (or both). The people of Toronto are spending as much time as possible huddled in our fleeciest pyjamas, waiting for spring. So far, the only sign of anything green outside is my condo complex's new Green Bin. Huzzah! Finally! For years I've wished that I didn't have to throw my compostable waste in with the rest of the garbage. I've been living in an apartment or condo for the past 15 years, so a backyard compost pile wasn't an option. I did look into indoor worm composters. But even if I had space for the large plastic bin the worms live in (it would have been a tight squeeze), one also needs time for care and maintenance of the bin, and space to harvest the compost. It was all just a bit more than I was willing to take on. Fortunately, the Green Bin program has arrived to rescue me from environmental guilt. It's even better than composting. You can put stuff in the Green Bin that wouldn't be compostable, like meat, and kitty litter. Even diapers and ladies' sanitary products are accepted. Each household was provided with a plastic bucket (with a lid and a handle) to collect Green waste in. You line it with a used plastic grocery bag. Whenever it gets full or stinky, you tie the top of the bag and walk it to the main Green Bin, near the garbage pickup area of the condo complex. It's less convenient than simply throwing a bag of trash down the chute, or even taking out recycling, which requires a trip downstairs to the recycling room, but it's not terrible. It only takes two minutes for me to walk to the Green Bin. Then you just slide open a hatch on the top, drop in your bag, and you're done. It'll be worse in the summer when the bin will stink to high heaven, but at least I don't live right next to it. There are are a couple of condo units that are literally adjacent to the bin, and they will not be enjoying the aroma in a few months. I'm so jealous! That sounds like an amazing compost program. I can't wait until I can compost again some day. In my adult life, the closest I had was throwing my fruit & vegetable waste in the marsh that was behind my house a few apartments ago. When my wife and I had a house we had one of those barrels you fill with compost waste and turn it every few weeks to make rich, dark dirt. And GAG did that smell horrid. EW! We have a small "green" bin here (one per household) which is collected weekly. It is the regular thing here in England (I think the whole of England) for everyone to have a small bin they keep in their kitchen and then put it in their larger "green" bin outside for weekly collection. I don't know what arrangements are made in blocks of flats. But it is not very smart to create special stinky bins right next to peoples' homes. this will lead to a lot of opposition to composting green, which is such a useful thing to do. You can also dump larger green waste in the council tip. It is made into compost there which you can then buy back at the regular compost price, to go on your garden. It just dawned on me that I do not compost here. Ron and I did at our other homes but never started a compost heap here. I will have to ponder that. I compost and recycle to the extent that we don't even fill one small garbage can a month. I don't garden much, so my compost just gets scattered around shrubs when it is ready. I do thrown citrus peels away because they're said to kill earthworms. Jenski: I never knew living next to a marsh could be so convenient. 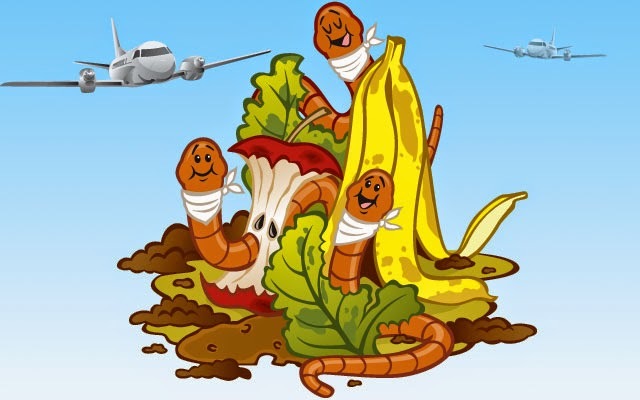 DarcKnyt: I had family that composted and the compost collector bin always had fruit flies hovering over it. Jenny: Unfortunately, because our complex was built without the Green Bin program in mind, there isn't anyplace to put the bin that's not near someone's living space. I suppose it could have been a bit further away from this particular patio, but I guess they figured they'd better put it right at the edge of a walkway, or someone would slip on ice or get hit by a car trying to access the bin, and sue the condo corporation. Lynn: Right, that's usually how it works. Snowbrush: I did not know that earthworms and citrus peels do not mix. I SO wish I could compost! I feel so guilty when I throw away things like eggshells or coffee grounds. Not because I'm "environmentally conscious" but because I love to garden! LOL Compost makes such awesome soil. :D Alas, apartment living doesn't lend well to such things.